So here’s a question for you, do you tell people your baby/child has Down’s Syndrome (obviously you don’t if they don’t have DS!)? It’s certainly not my opening line when meeting new people, but I do tend to casually throw it in there just to clear the air and acknowledge the obvious. Even though Audrey looks less and less “downsie” (our choice of phrase, one used to be cute, not offensive) to me everyday, I do know that she has the characteristics and strangers will either clock this and know, or at least wonder. We actually do sometimes start to think it’s not obvious, but then we look at other babies with DS and she is quite clearly in their crew. It’s funny because it means we often look on other babies with extra “ahhhs” because they look like our baby. Our first experience of a stranger actually acknowledging Audrey’s DS before we’d said anything was a barmaid (early 20s?) in a pub we were celebrating my Nan’s 95th birthday in. 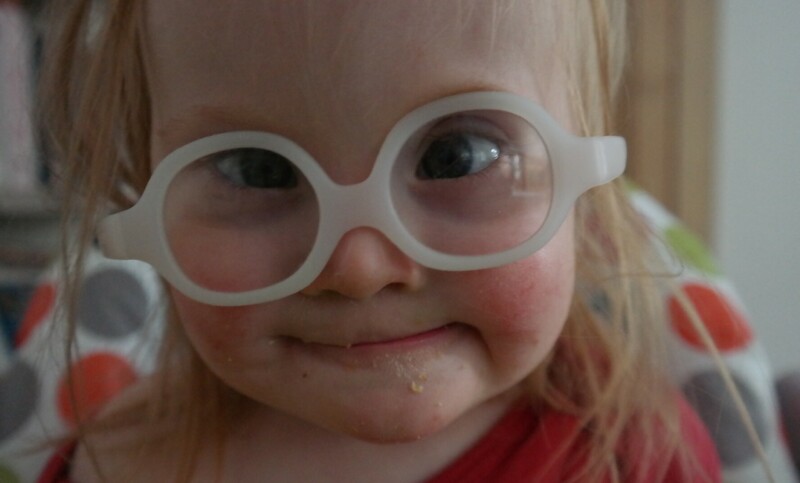 She just said “Down’s Syndrome babies are extra cute aren’t they?” And to be honest I felt a little surprised for a second (only because I hadn’t heard anyone just come our and say it like that) but I just smiled, said yes and moved on. But it did feel strange. Oh so they can see it…! Another time, we were at a friends’ BBQ where lots of families we didn’t know were milling about. A child of around 6 was playing near Audrey and asked me why her tongue was sticking out. I just said she was dribbly and teething and it was just something she does. But at the time I had a little moment where I realised I was so used to Audrey’s tongue sticking out, it hadn’t occurred to me that this might be ‘something different’ about her that others would notice. One of many strange worries I had in the early days, was of someone recognising her DS and saying something very unpleasant. Perhaps asking me if she was ‘retarded’ or a ‘mong’, neither of which have cropped up at this early stage. As time went on, I did start to chastise myself (“What decade did you think we are living in?! ?”), but actually had a mum of a 3 year old boy with DS confirm someone did once ask if he was a ‘mongoloid’. I was stunned, but she said it was a very old lady and she was actually very nice, she just used a dated word and meant no offence. In our short 15 months in this world, we haven’t had a lot of negativity to deal with. In the early days, there were some people who struggled with what to say and made some comments that were… Awkward… But mostly well-meaning and not nasty. People just saying how ‘devastated’ we must be or how ‘awful’ the news was… Which, once you’ve moved on and embraced the baby you’ve been given, is not they way to describe the happy event of having a baby. My uncle also had a classic line… When we were discussing sleep and night feeds (which every one is obsessed with when making baby small talk), I referred to our NCT group and said we were lucky as some of the babies were waking a lot more than Audrey… To which he said (somehow thinking I was taking about a group of babies with DS and that some of them were ‘worse'(?) than Audrey); “Oh yes, some of them can be very disabled, can’t they?”. Yeesh. In fact that was probably the main crux of any early negativity – misunderstanding that 90% of the time I was entering into a discussion about babies in general, not specifically babies with DS. Telling my mum we had started baby sign; “But she’s not deaf, I know some of them can be, but you can tell she can hear”. Cue discussion about baby sign being useful for all babies. Mostly I worry that it my own insecurities/defensiveness that makes me read innocent comments as negative. When people ask about the possibility of us having baby number 2, I always feel as though they are surprised when we say we do want more children or I feel the question is worded as “So do you think you’ll have any more children?” and the end of the sentence (that is unspoken) is “…after what you’ve been through with this one?”. Yes, I’m reading into this too much! One of the strangest places to encounter negativity (which was really just someone being honest, but made me uncomfortable), surprisingly came from another DS mama. I was at our pre-school DS group when Audrey was probably only around 5 months old and I was keen to meet a lady who had chosen a nursery near us for her little boy with DS and I wanted to know what the nursery was like etc. She came to the group with her new baby boy (without DS) as her oldest was at nursery that day. She told me I was lucky Audrey kept her tongue in her mouth (things have changed a bit since then! ), because the tongue hanging out “did not look good”. And then she told me how they had the amniocentesis for their second child as they “definitely didn’t want another child with DS”. Hmmm, I think I said nothing at that point. I asked about the nursery and she said they picked it because they had lived on the same street… so that wasn’t the glowing reference for the place I was hoping for. I haven’t actually seen her since, but it was certainly interesting meeting someone who felt that having a child with DS meant they had to take screening that bit further to ensure they didn’t have another. Ted and I have said that if we are lucky enough to have another baby, it’s probably not worth bothering with the screening as what difference would it make? We wouldn’t abort and although a bit of warning might help us prepare, we had no warning with Audrey and that turned out fine! Ha, well, better than fine – awesome! We went to visit friends in London on Friday, so Audrey had her first trip up there, we used the sling rather than the buggy to make the tube easier to handle. She coped very well, especially considering the rammed train journey home and everything generally being very loud and crowded. We hit Borough Market and spent crazy money on crazy food… Fancy cheese, truffle honey and ridiculous donuts filled to the brim with custard. Our friends have twins arriving any day, so they needed the calories to keep their strength up! 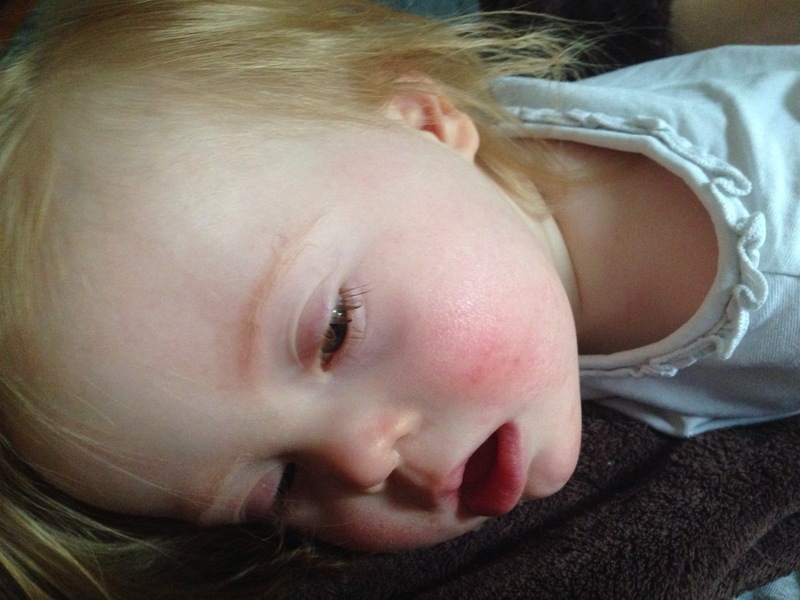 Unfortunately Audrey has picked up a bug from nursery and has been on/off ill since Friday afternoon. Today was going to be one of my naughty days off, where I go to the cinema and relax whilst Audrey is at nursery… Unfortunately her raised temperature, lack of interest in food and incessant cough were impossible to ignore, so I am currently watching Nurse Jackie whilst she naps and then we’re off to the doctor at 11am. October is Down Syndrome Awareness Month. I love a good hashtag so… #DSAM2014. 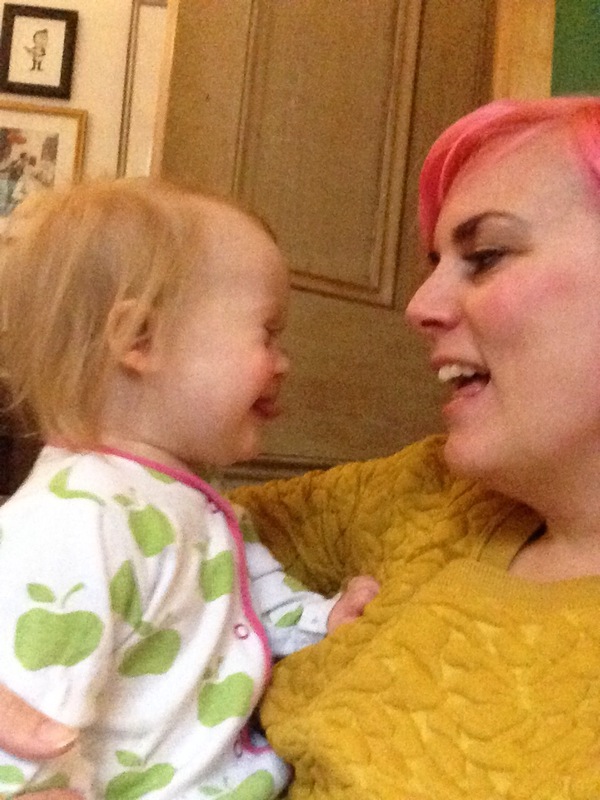 Raising awareness, (as I believe I’ve already rambled on about), is important because it helps new families and anyone who might come in contact with someone who has Down’s Syndrome feel more comfortable. I appreciate there are tons of blogs raising awareness and giving important information on DS, in fact, there are too many for me to read! Yet I know that outside of the DS bubble, they are likely to go unnoticed. I certainly never noticed DSAM pre-Audrey! But when Audrey was just days old, I gorged on birth stories – reading those was such an amazing, cathartic, experience. It was also a little like poking a bruise – reliving those overwhelming, negative emotions. I guess it feels ok to have had crazy, negative thoughts if other people felt that way too… Especially if, look! they’ve made it out the other side and are so happy! There was so much positivity to cling to and help us through those confusing first days/weeks/months. And even though we are only 15 months into our journey, I still feel like we’ve come a hell of a long way and also that I have a responsibility to give back… That I should be sharing our story just in case someone else finds it useful/a comfort/interesting. I also want to make sure that sharing out story seems ‘normal’ (whatever normal is), but you know, not too special-needsy. Much of what we experience with Audrey is just what everyone is experiencing with their little ones. In fact, I got so motivated to spread DS awareness this week I did something I thought I’d never do…. 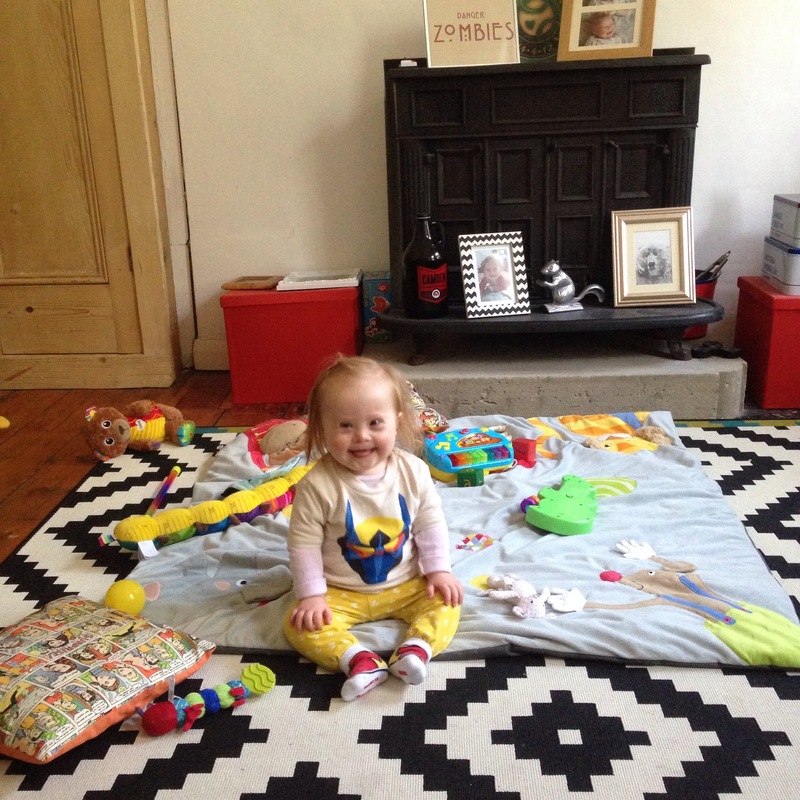 I joined Mumsnet… dun dun dun! I thought I could start a thread, offer up a Q&A for women who had either just had a baby with Down’s Syndrome unexpectedly or answer some questions for women with a prenatal diagnosis or ‘high risk’ screening. I was worried that rummaging on the dreaded Mumsnet might actually upset me – that there would be a lot of negativity and discussion around ‘high risk’ results and planned terminations. I only looked at one thread relating to the screening and someone sensible advised the expectant mother to look at, or comment in the special needs section of the site. Aha, so I had underestimated Mumsnet! They have a special needs section in the chat forums! I sort of felt like I wasn’t needed! More on mummy forums in another post… I have a need to rant about them, but now is not the time! 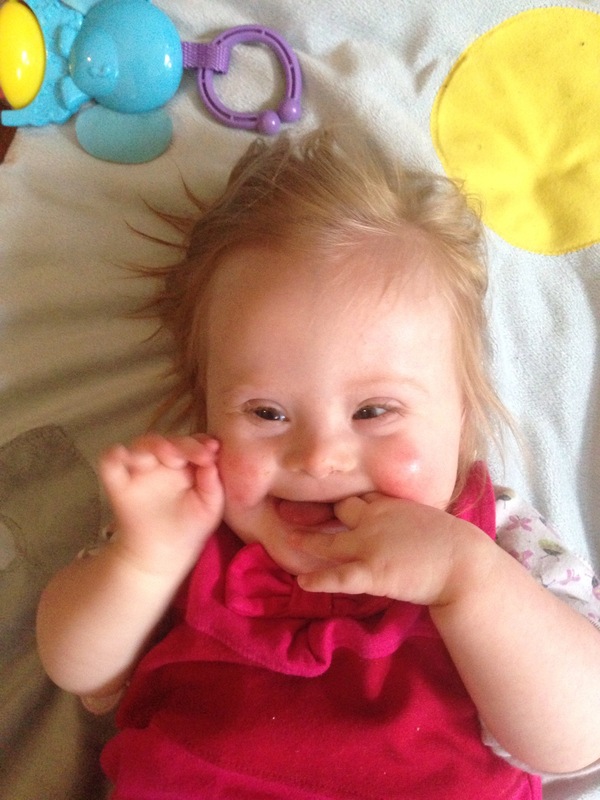 Down Syndrome Awareness Month has definitely helped me picture a better future for Audrey and helped me get through some tough early months… So now a year on from our first DSAM, I hope our story is helping some other new mama feel a bit better about it all. Audrey first heard music (outside of the womb) in the arms of her daddy whilst mummy took a shower. We were in the room on the baby unit, where we had to spend the night and see how we got on with Audrey. A sort of transitional home from home, with nurses checking her over and weighing her (oh that obsession with her weight! So glad it’s over). We would not be allowed home unless she gained weight! I entered the bedroom to be greeted by The Supremes singing “Baby Love”, Ted cradling Audrey in tears. She was 3 weeks old and looked like a music fan already. It was a bit of a turning point as she was no longer on the ward and seemed more like “ours”, plus a reaction to music made her that more… normal. 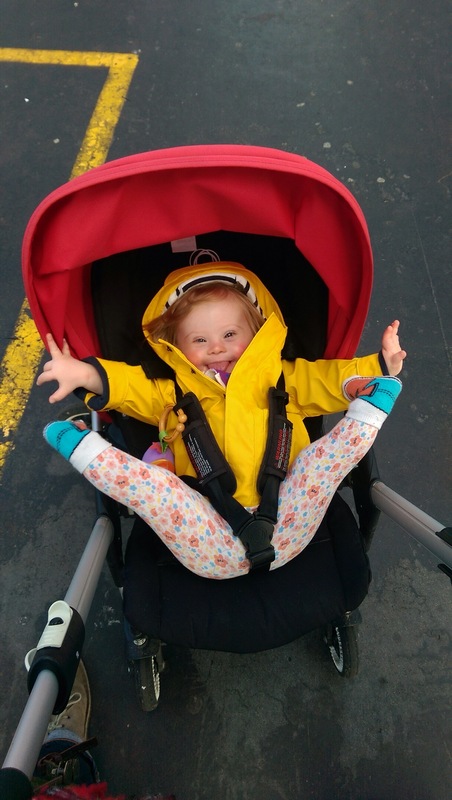 I know that might sound ridiculous, but when your head is full of “difficulties” and “special needs”, it makes you think things won’t ever be “normal” and you worry what sort of interaction you might get from your little one. Of course I know now that those worries were pointless, but every little moment like this one served to teach me that. We have played Audrey a lot of music since then, everything from The Beastie Boys to Blur to opera. She likes a good beat and from around 13/14 months she started dancing (rocking back and forth whilst sitting), which is amazing. Of course Audrey loves the irritating music from a tacky, bright, light-up toy too and is getting quite adept at bashing the right places to get the music going! Thankfully she is just as happy to listen to music we like, especially when we sing along and dance around the room. I’ve had several of those funny lyric-realisation moments that have led to tears… You know when you’re a teenager and suddenly you understand what the love songs are about? (Imagine me, 90s teen, ‘Again’ by Janet Jackson on repeat…). Well you get to experience that revelation again after having a baby. When Stevie Wonder (one of my favourites), sings “Isn’t she lovely, made from love” I get such a warm, positive feeling. “Made from love” just gets me every time. It sums up making Audrey. Is a space that you now hold. It reminds me of when we reminisced about Audrey’s scan picture (she was pouting or sticking out her tongue) and the fact that she was such an active, kicky baby. There we were, looking at her a few weeks old, little tongue sticking out, as she kicked her legs… And then we realised there was no need to mourn the baby we thought was there – it was Audrey all along! I mentioned a few posts back that I was in touch with a woman who had prenatal screening that advised 99% that the foetus had Down’s Syndrome. I couldn’t offer her the perspective of someone who knew they were carrying a child with special needs, so I put her in touch with someone who could. Today we found out that she decided to terminate. I am NOT saying she shouldn’t have terminated or that our input should have made her want to keep the baby, I’m just saddened that it’s so scary to have a child with special needs that there’s a way to opt out. I’m saddened that this is the norm. 92% of women who receive a prenatal diagnosis of DS, terminate and whilst I don’t know what it’s like to receive the news whilst pregnant, I do know what it’s like to feel like the diagnosis is the worst thing in the world and soon find out it’s not. In this particular case, the woman in question met with several families, spoke to/emailed others… so she probably had more information than most before making the decision. I guess that’s really why I find the news so upsetting; even with support and positivity from the Down’s Syndrome community; she still felt she couldn’t keep the baby. Whilst I know the decision wouldn’t have been taken lightly and I think she was very brave to contact DS families to help her and her partner make the choice, it still feels like we all failed to convince her it would be ok in the end. This experience has made me more determined than ever to raise awareness and get people falling in love with Audrey. 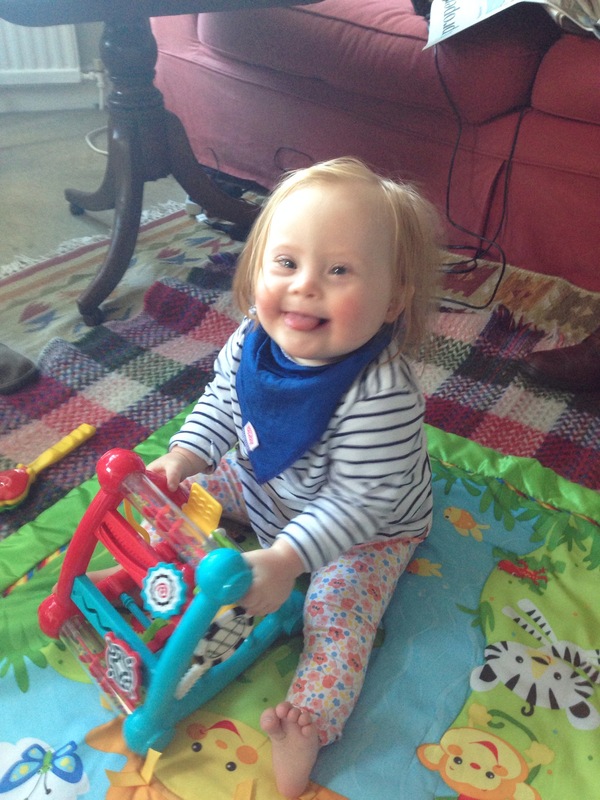 I hope our family can be a source of comfort, inspiration and hope for anyone wondering what life with a baby with DS is like. We went to a wedding reception in Hackney on Friday night. It was quite a big deal to be leaving Audrey with Bibi (Grandma Sarah) for the night, first time Ted and I had both stayed away without her. 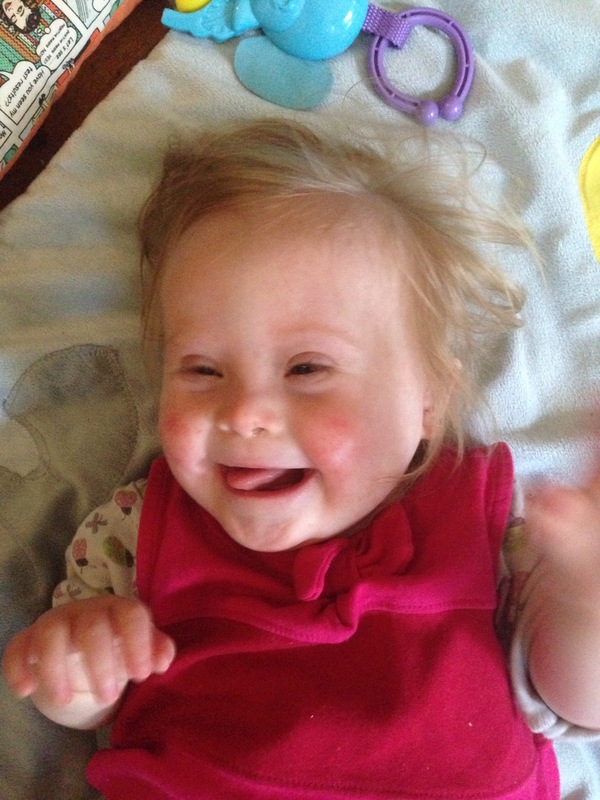 Sometimes I find it hard to relinquish control over Audrey… I never thought I’d be a routine mum, but I majorly am! I have decided to blame those first months when I was told not to leave Audrey longer than 4 hours without a feed… In those early days the pressure to “grow her” rested heavy on my shoulders and the slow, disappointing weight gain felt like my failure (since it was my breast milk trying to work its magic). But I digress… Our hotel was… scary, weird, cheap, but thankfully reasonably clean and very close to the wedding venue. It was a trendy London brewery, with free beer, so Ted was of no use to me from around 11pm that night to around 12pm the next day! We returned via Arundel to collect the little monkey (who had been happy and fine with Bibi, of course) and our return journey to Brighton was a debacle. Cancelled trains led to a brutal all-round-the-houses 2 hour trip on the 700 bus from Littlehampton to Brighton. Audrey of course slept for much of the journey, but she was also fed her (emergency purchase!) Ella’s on the bus. At the front of the bus (as close to the driver as you could hope for), were two young male adults with special needs talking loudly and regularly checking in with their guardian, Holly, by shouting back at her across the bus. One of the lads proudly declared he was driving the bus and they were definitely enjoying the journey more than anyone else. “No, we went with Frankie and she said ‘Never again'”. This had half the bus in stitches. Around this time a large, partially sighted young man got on the bus and sat near us. It became apparent he too had special needs and he started up a conversation, saying “I hope you don’t mind, I like to chat to people”. We were very obliging and he asked us lots of questions about where we worked, what songs Audrey listens to at nursery, where we’d been that day… But the main focus was Clark’s (his name was Clark) diving practice. He had been diving off the diving board most of the day and is gearing up to jump from the highest board. He wanted to know what would we do if he was to dive from the highest board? He then explained that he always shouted as he dived; “123 – UNIVERSITY!”. The conversation was often a test of our intelligence and memory…. Clark helped us pass the time between Shoreham and Brighton and finally we were home. The presence of these people with special needs on the bus didn’t teach us an amazing life lesson – this story doesn’t have a climactic ending… It’s just that; of everyone on that journey, they were by far the ones having the most fun. Between me (practically in tears as we rushed to get food for Audrey, because I was so upset with myself for not being prepared and for her routine being thrown – I try to be casual, I fail! )… the woman who had a go at every train guard and for some reason was travelling all day and hadn’t eaten, but had no money to buy food… the people queuing in the road obstructing the bus… basically all of that stress – there were these journey companions who were bloody loving it! And a little bit of that enthusiasm did rub off – everyone had a giggle. Oh to be a bus lover.